Asian Mexicans (Spanish: mexicanos asiáticos; asiomexicanos) are Mexicans of Asian descent. Although they make up less than 1% of the total population of Mexico, they are a notable minority. Asians are considered the cuarta raíz (fourth root) of Mexico in conjunction with the three other roots: Native, European and African. Due to the historical and contemporary perception in Mexican society of what constitutes Asian culture, this article focuses on Mexicans of East, South and Southeast Asian descent. For Mexicans of West Asian descent see Arab Mexican and Turks in Mexico. The first record of an Asian in Mexico is from 1540; an enslaved cook originating from Calicut bought by Juan de Zumárraga in Spain and subsequently relocated to Mexico. However, regular immigration did not begin until 1565 with the establishment of the Manila-Acapulco Galleon (lasting until 1815), which economically linked Asia, the Americas and Europe. During those two and a half centuries, many Filipinos, Mexicans and others sailed to and from Mexico and the Philippines as sailors, crews, slaves, prisoners, adventurers and soldiers. Also on these voyages, thousands of Asian individuals (mostly males) were brought to Mexico as slaves and were called chinos or indios chinos, which meant Chinese. Although in reality they were of diverse origins, including Japanese, Koreans, Malays, Filipinos, Javanese, Cambodians, Timorese, and people from Bengal, India, Ceylon, Makassar, Tidore, Terenate, and China. A notable example of a china slave is Catarina de San Juan (Mirra), an Indian girl captured by the Portuguese and sold into slavery in Manila. She arrived in New Spain, became well known for her religious piety and eventually became associated with the "China Poblana". Depiction of the Parián market in Mexico City's Zócalo, ca. 1770. In the colonial Philippines, parián districts were Chinese merchant neighborhoods and the name was given to important markets in colonial Mexico that sold the products brought by the Galleons. The estimate of the number of Asian immigrants during the Colonial era range from 40,000 to 120,000. By comparison, during the Colonial era Mexico received about half a million Europeans and 250,000 Africans. These early individuals, the foundation of the cuarta raíz, are not very apparent in modern Mexico for a few reasons: relatively small numbers, the widespread mestizaje (racial mixing) of Colonial Mexico and the common practice of Chino slaves to "pass" as Indios (the indigenous people of Mexico) in order to attain freedom. As had occurred with a large portion of Mexico's black population, over generations the Asian populace was absorbed into the general Mestizo population. Facilitating this miscegenation was the assimilation of Asians into the indigenous population. The indigenous people were legally protected from chattel slavery, and by being recognized as part of this group, Asian slaves could claim they were wrongly enslaved. Many Asians (both free and enslaved) worked on coconut plantations in the Southwest. There are examples of free Asians who held land, including Filipino Andrés Rosales who owned twenty-eight coconut palms in 1619. Asians were active in the politics of Colima; enough so that the position alcalde de los chinos (Mayor of the Chinos) was created. In the years 1613 through 1620, Hasekura Tsunenaga headed a diplomatic mission on behalf of Japan to the Vatican in Rome, traveling through New Spain (arriving in Acapulco and departing from Veracruz) and visiting various ports-of-call in Europe. Although the final destination was not Mexico, this mission is viewed as the beginning of Japan–Mexico relations. A notable case of free Asians working in an urban setting is the 1635 conflict between chino and Spanish barbers in Mexico City. The legal case resulted in the expulsion of the Asians from the city center, limit on their numbers to twelve and prohibition on adopting Asian apprentices. Nonetheless, a 1667 document from the Real Audiencia details the attempt to limit the more than one hundred barber shops run by Asians without a license to twelve. Some chinos held certain rights not afforded to most indigenous peoples (indios), such as carrying a sword/dagger or riding a horse. Examples exist of chinos proving their standing to authorities in order to carry arms; such as the 1654 case of Marcos de Villanueva, arguing that his people helped quell a sangley rebellion in Manila. Others argued that carrying arms were a necessity when traveling through remote areas with merchandise. The most privileged Asians were the samurai that remained in Mexico from the Japanese envoys. Japanese immigrant workers at the mine of Cananea, Sonora in the 1910s. Japanese immigration began in earnest in 1888 after the signing of a treaty to allow citizens of both countries the ability to travel to the other and establishing consulates. 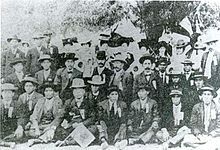 Mexico was the first Latin American country to receive organized Japanese immigration in 1897, with the first thirty five arriving to Chiapas under the auspices of Viscount Enomoto Takeaki, with the permission of president Porfirio Díaz. The very first settlement was based on coffee production but failed for various reasons including the fact that not all of the colonists were farmers and many became sick with tropical diseases. Many from this colony dispersed but there remains a small Japanese community in Acacoyagua, Chiapas. Modern Korean immigration to Mexico began in 1905. The first 1,033 Korean migrants settled in Yucatán as workers in henequen plantations. Asians, predominantly Chinese, became Mexico’s fastest-growing immigrant group from the 1880s to the 1920s, exploding from about 1,500 in 1895 to more than 20,000 in 1910. It was common among male Asian immigrants to quickly marry local women in order to facilitate assimilation. To do so, they were baptized into the Catholic faith, adopting a Christian name in the process. By doing this, they achieved a stronger bond with the land and a stronger sense of social belonging. They also received greater economic, moral and labor support from their new extended Mexican families. At the same time, an anti-Chinese movement emerged during the Mexican Revolution and peaked during the Great Depression. This was in part due to resentment over the success of Chinese merchants and also fear of competition from Chinese workers willing to work for less pay. The most severe act of violence occurred in 1911. A massacre of over 300 Chinese in Torreón, Coahuila, which was carried out by a faction of Pancho Villa’s army. It culminated in mass deportations in the 1930s, when nearly 70% of the country's Chinese and Chinese-Mexican population was deported or otherwise expelled from the country. Before World War II, the highest concentrations of Japanese and Japanese descent were in Baja California, followed by Mexico City and Sonora. Up until the war, the treatment of Japanese in the country and their descendents had been favorable, very different from the treatment of Chinese in the country. However, Japanese immigration was halted by WWII to near zero, and those who were in the country were faced with restrictions and relocation after Mexico broke diplomatic ties with Japan in 1941. Most Japanese citizens (especially the ones living in the Northwest) were forced to move to three interior cities: Celaya, Guadalajara and Mexico City. This was done so that they could not be used as a “fifth column" by the Japanese government. This treatment of ethnic Japanese is not in most accounts of Mexican history and is seldom taught in schools. While in China, the Chinese-Mexicans that had been deported campaigned to be allowed to return to Mexico, from the 1930s to the 1960s. There was some success with two repatriations; one in the late 1930s and another in 1960. After the end of the war, Japanese immigration to Mexico began again. From 1951 to 1978, this immigration was associated with Japan’s economic growth, giving it money to invest abroad. A new smaller wave of Korean migrants also began to arrive in Mexico in the 1970s. Larger numbers of Koreans began arriving in the 1990s: according to South Korean government statistics, the size of the community reached its peak in 1997 with around 19,500 individuals before falling to 14,571 by 2005. Of the 54,440 migrants granted permanent residency in 2013, 7,666 (14.08%) were Asian. 4,743 (8.71%) were Chinese, more than any other group except for Americans with 12,905 (23.7%). According to the Indian Ministry of External Affairs, there are about 2,000 Indians living in Mexico as of March 2011. According to the 2011 report of South Korea's Ministry of Foreign Affairs and Trade on overseas Korean populations, 11,800 overseas Koreans resided in Mexico. It is also claimed that the descendants of early henequen plantation laborers alone might number as many as thirty thousand. In 1997, descendents of Japanese immigrants celebrated a century of Japanese immigration into Mexico, with an estimated 30,000 people of Japanese nationality or ethnicity living in Mexico. There are about 10,000 full-blooded Chinese in Mexicali, down from 35,000 in the 1920s. Marriage of these people with the general Mexican population is common. Nowadays, there are about 50,000 partial or full-blooded Chinese in the area. There are about 70,000 people of Chinese descent living in Mexico, as of 2008. There is significant recent Asian genetic contribution to the population of the Southwest as a result of the Manila-Acapulco galleons. In southwestern Mexico, especially in the State of Guerrero, part of the reason they survived as a distinct ethnic group is the relative isolation of the area -with high mountains and uncrossed rivers- that made contact with the rest of the country difficult. Based on genomic research, about a third of the sampled population of Guerrero had some Asian ancestry; with the genetic markers being most similar to those of the populations of the Philippines and Indonesia. A 17th century biombo (from Japanese byōbu) depicting the Conquest of Mexico. These folding screens first became popular in colonial Mexico following diplomatic contact, however most were produced in Mexico rather than imported from Japan. The strongest Asian influence on the culture of Mexico happened during the colonial era, many aspects of which modern Mexicans may not be aware of. Notable Filipino contributions during this era include tuba (palm wine) and possibly the guayabera. Malay words also entered Mexican vernacular, such as the word for palapa. Asian influence during the colonial era can probably best be seen in the art of Mexico. Among the various luxury goods that arrived on the Manilla Galleons were lacquerware, porcelains and folding screens. These items were meant for the New Spanish elite, but as these goods, especially textiles, became more common, they reached the masses. Chinese porcelain, especially the kind showing blue decoration on white, had an important effect on Mexican ceramics. The ceramic industry in Puebla included decorative elements like the phoenix, peonies, chrysanthemums, pagodas and willows. Chinese artisans, and probably some Japanese, participated in the manufacturing of talavera. Folding screens were introduced from Japan, with Mexican-style ones produced called biombos. The earliest of these Mexican made screens had Asian designs but later ones had European and Mexican themes. As well as the Asian-influenced artworks known as enconchados, paintings that incorporated mother-of-pearl. The majority of the cargo on the Galleons were textiles which also had a profound influence on the textiles of Mexico; such as the paliacate and the change of material/decorative motifs of rebozos. The lacquerware of Michoacan and Guerrero traces its origins to pre-Hispanic indigenous traditions and was heavily influenced by the cargo and artisans that were brought by the Galleons. The "pajaritos de la suerte", a common street performance in Mexico where a bird randomly chooses a fortune for the spectator may have Asian origins, possible sources include omikuji and a similar tradition from China existing since at least the 19th century. There are two major Chinese communities or “Chinatowns” in Mexico today: La Chinesca in Mexicali and the Barrio Chino in Mexico City. Mexicali still has more Chinese, mostly Cantonese, restaurants per capita than any other city in Mexico, with over a thousand in the city. The Comunidad China de México, A.C., established in 1980, sponsors Chinese festivals, classes and other activities to preserve and promote Chinese-Mexican culture in Mexico City. Café de chinos, which became popular in 20th century Mexico City, were run by Chinese Mexicans and offered an assortment of local and mixed cuisine . The Liceo Mexicano Japonés in Mexico City was founded, in part, to preserve Japanese culture. There has been a notable influx of young Japanese artists into Mexico since 1978, who have settled mostly in Mexico City. They have come because they have found it easier to develop their careers in Mexico, as the art market in Japan is very small and very hard to break into. Cacahuates japoneses (lit. Japanese peanuts) are a popular snack in Mexico and were created by Japanese immigrant Yoshigei Nakatani (father of artist Carlos Nakatani) in 1945. The majority of the Japanese Mexican community (some 90%) is Roman Catholic. Every year since 1949, hundreds of members of the community make the pilgrimage to visit the Virgen de Guadalupe in kimonos. Mexico City's Zona Rosa district has a Koreatown dubbed Pequeño Seúl (Little Seoul), filled with businesses established by new migrants. In the same neighborhood, the Escuela Coreana en México, found its home in 2010 after two decades of occupying a variety of rented facilities. That year it was able to acquire its own premises thanks to US$850,000 donations by companies and other benefactors to the Asociación de Residentes Coreanos en México. Taekwondo was introduced to Mexico in 1969 by Dai-won Moon. With over 1.5 million taekwondo practitioners and 3,500 schools throughout the country, taekwondo is one of the most popular sports in the nation. Mexico has medaled in taekwondo at all Olympic Games since it became a full medal sport at the 2000 Olympics, and currently places fifth overall on the medal count for the sport. For a more comprehensive list, see List of Asian Mexicans. Under Dr. Jesús Kumate Rodríguez, the Secretariat of Health oversaw the implementation of universal vaccination, the eradication of poliomyelitis and a sharp decrease in infant mortality. ^ Roberto Chao Romero (2011). The Chinese in Mexico, 1882-1940. University of Arizona Press. p. 8. ISBN 9780816508198. ^ a b "La Música de Guerrero (Del atabal a la flauta, el son y el zapateado)". Gobierno del Estado de Guerrero. Archived from the original on 2015-02-20. Retrieved 20 February 2015. ^ Oropeza Keresey, Déborah. "La esclavitud asiática en el virreinato de la Nueva España, 1565-1673". Universidad Michoacana de San Nicolás de Hidalgo. Retrieved 19 December 2016. ^ a b c d e f g h i j Carrillo, Rubén. "Asia llega a América. Migración e influencia cultural asiática en Nueva España (1565-1815)". www.raco.cat. Asiadémica. Retrieved 19 December 2016. ^ Tatiana Seijas (2014). Asian Slaves in Colonial Mexico: From Chinos to Indian. Cambridge University Press. p. 21. ISBN 9781107063129. ^ Leslie Bethell (1984). Leslie Bethell (ed.). The Cambridge History of Latin America. Volume 2 of The Cambridge History of Latin America: Colonial Latin America. I-II (illustrated, reprint ed.). Cambridge University Press. p. 21. ISBN 0521245168. ^ Ignacio López-Calvo (2013). The Affinity of the Eye: Writing Nikkei in Peru. Fernando Iwasaki. University of Arizona Press. p. 134. ISBN 0816599874. ^ Dirk Hoerder (2002). Cultures in Contact: World Migrations in the Second Millennium. Andrew Gordon, Alexander Keyssar, Daniel James. Duke University Press. p. 200. ISBN 0822384078. ^ Terui, Megumi (2005). "Migrantes japoneses en México: la trayectoria de investigación de Ota Mishima" [Japanese immigrants in Mexico: the trajectory of the research of Ota Mishima] (PDF). CONfines (in Spanish). Mexico: ITESM. Retrieved 18 October 2014. ^ Ministry of Foreign Affairs of Japan (2012). "Japan-Mexico foreign relations". MOFA. Retrieved October 22, 2014. ^ a b c Hahkyung Kim (2012). "Korean Immigrants' Place in the Discourse of Mestizaje: A History of Race-Class Dynamics and Asian Immigration in Yucatán, Mexico" (PDF). Revista Iberoamericana. Retrieved November 20, 2014. ^ Buchenau, Jürgen (Spring 2001). "Small Numbers, Great Impact: Mexico and Its Immigrants, 1821-1973" (PDF). Journal of American Ethnic History. 20 (3): 35. ^ a b c Emma Chrishuru Nakatani Sánchez (2001). "Memorias de un inmigrante japonés" (PDF). Istor. Retrieved November 5, 2014. ^ Zenyazen Flores (2014). "México vive segunda oleada de inmigrantes provenientes de China". El Financiero. Retrieved October 22, 2014. ^ Rodriguez, Olga R. (November 24, 2012). "Chinese-Mexicans Celebrate Return To Mexico". The Huffington Post. ^ Wade, Lizzie (11 April 2018). "Latin America's lost histories revealed in modern DNA". Science Magazine. Retrieved 28 March 2019. ^ a b c d e Ibarra, Laura. "El origen chino de las cajitas michoacanas, el paliacate y las casullas". Milenio. Retrieved 28 February 2015. ^ "Cacahuate japonés, una dura historia". El Universal. Retrieved October 18, 2014. ^ a b "Colonia japonesa en México visita Guadalupe en 54º peregrinación anual". Aciprensa. Retrieved 20 February 2014. ^ "Moon Dai-won: father of Mexican taekwondo". Korea Times. Retrieved October 19, 2014.